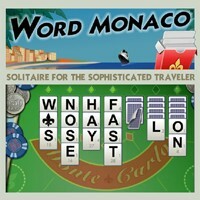 Relax under the warm sun of the Mediterranean and play a unique blend of word-creation and solitaire. Create words by moving letters from column to column and use power-ups for bonus points. When all of the letters are used, you'll move on to the next of 75 progressively difficult levels in 6 different locations! With a word list of over 50,000+ words and 5 decks of varying difficulty, there are endless possibilities.